Well, I’ve finally started a blog. I’ve been debating about it for a long time. But I love to sew and there are so may wonderfully creative people who have such lovely blogs, that I thought I’d like to add my voice and share some of the fun, quirky and beautiful things that inspire me. I just finished my version of a Donna Karan dress, courtesy of Vogue Patterns. I was very intrigued with the design of the dress, and WOW – was it ever an ingenious feat of engineering. I don’t have a clue in the world about pattern drafting. After making this dress, I wish I did! I don’t know if I’ll actually WEAR this dress – but it was sure fun to make! The pattern described the dress as a close-fitting, above mid-knee length, pullover, lined dress has contrast bodice back, seam detail, pleated front and back, side front in-seam pockets and puffed hem. The markings on the pattern were very good, and the instructions were clear. The only exception to this was the instructions for the front bodice pleat in the lining, which I’m still not sure of, although I made it work. I was drawn to the dress by the very unusual-ness of the design. Vogue used to publish “Vogue Individualist” patterns in the 80’s and 90’s, and I loved them: I was guaranteed not to walk into myself on the street (which is one of the reasons that I started sewing – I didn’t want to look like everyone else!) But it wasn’t until I started putting this dress together that I really appreciated the absolute genius of design. The pieces are cut sometimes oddly on the straight grain to make use of the bias in areas that could use a bit of give i.e. the front bodice. However, bias, even in a medium-weight linen like I used, does have a tendency to keep stretching. Problem solved by the design: almost every bias edge is connected to a straight grain edge. I am totally wowed by the architectural engineering that went into this pattern design. I sewed this out of a medium-weight linen and matching (fluke!) washed silk charmeuse from my stash. The pattern suggests LIGHTWEIGHT linen, and I would agree with that from the construction point of view, but the medium-weight linen shows the design of the dress off better than a lighter weight fabric would. I think the original on the pattern must be made of the paper taffeta or something similar, which would hold the pleats crisply without a lot of weight or bulk. Then I had to adjust the lining. 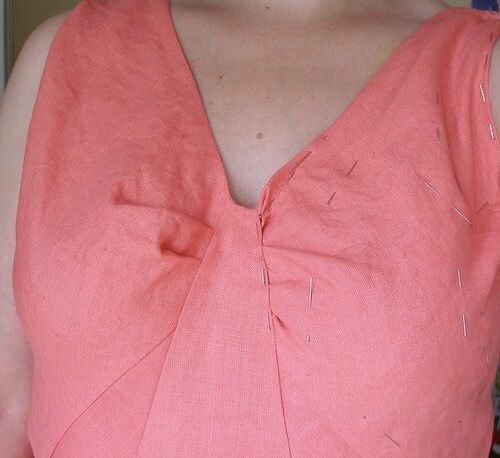 During the construction of the dress, I really noticed the bulk of the linen I was using. I graded all the seams, but in the back the linen is attached to the silk charmeuse bodice. I was concerned about the weight, although again, the design ingeniously used the grain to make the back bodice pieces stable in order to prevent sagging. 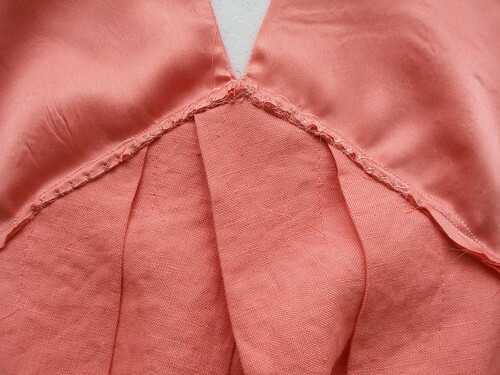 However, I underlined the back bodice with silk organza just to add that extra stability given the weight of the linen. Then I graded the seams and catch-stitched them in place. Once I tried the dress on, I realized I had a problem in the bust area. I made further pin alterations. Apparently I had added too much in my original FBA. Also, the lining through the bust area is cut on the straight grain, which totally negated the give of the bias fabric. So I ended up re-cutting the front top half of the lining pattern adding a pleat from the shoulder to the bust point to add the width I required through the bust point without bulking up the shoulder of the bodice. 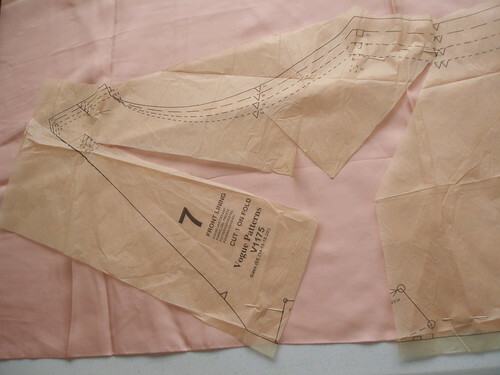 I also forgot about my usual waist shortening of 2″ in my original pattern adjustment. So I shortened the shoulder the required amount which had an added benefit: it brought the armscye up 2″ so that any bra is covered. The original armscye was at the bustpoint line, which is too low if you’re planning to wear undergarments. I had a fantastic time putting it together and marveling over the drafting. I think this dress would be an AMAZING evening piece. What a statement dress. I love pieces like this – they’re one-of-a-kind and a little bit edgy. And that’s why I love to sew what I wear! Fabulous! This helps me tremendously with my construction of this dress. Thanks so much. I like your fashion show on PR. Thank you for also showing images of your FBAs. I really appreciate seeing how you execute those alterations, as I have to FBA so many garments.